The Peak District, despite it’s name, doesn’t have the high mountains of the Lakes, Wales or Scotland and so doesn’t give the opportunity for running constantly uphill for much more than 300 metres (1000ft). But if you know where to go you can combine multiple climbs and descents in order to pack a decent amount of ascent into your run. 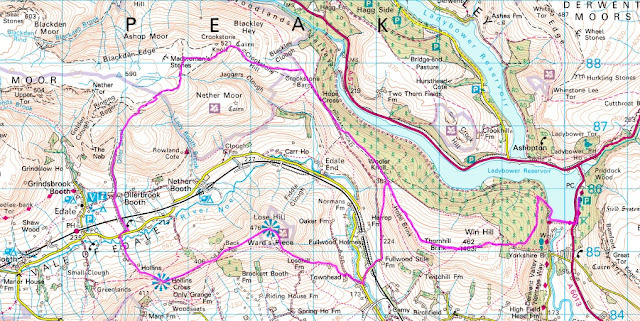 Win Hill and Lose Hill are less than 4km apart and stand as guardians over the southern side of Ladybower reservoir. At 462m and 476m respectively they are not the highest points in the Peak, in fact Kinder is more than 150m higher. However unlike the higher plateaus of Kinder and Bleaklow these two hills are in fact peaks having relatively steep aspects, dropping 300m from their summits into the surrounding valleys of the Derwent and the Noe. Viewed from certain aspects Win Hill gives the feel of a mountain with its rocky “Pike” dominating the skyline. The pair are easily accessible from several points and so give numerous places to start and finish as well as offering different distances of route. My regular run starts at the car park on the east side of Ladybower. I cross the road and dam wall and depending on my mood turn left or right to either tackle the fiercely steep Parkin Clough or take the just steep path which switchbacks up through the woodland. Both paths emerge at a gate and the route follows a path due west. I push on hard to the summit, rewarding my effort with a pause at the top to take in the fantastic views. My gaze is draw across Ladybower and the A57 to the rocky crest of Derwent Edge and then the darker hills to the north. Turning to the west I see a distant Mam Tor and closer, Lose Hill just over 3km away as the crow flies, this is my next target. I have a choice of routes, today choosing to continue northwest towards Wooler Knoll before kinking left and down to pick up the road to Fullwood Stile Farm. I back off the pace as I cross the railway and drop down to the river – I know from experience that the 2km climb to come will hurt. 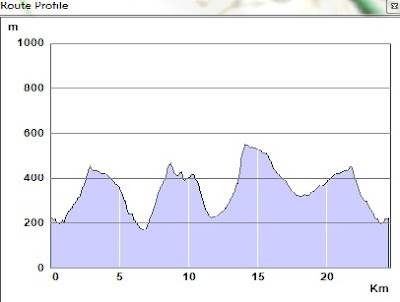 I glance at my watch as I turn off the road and start the climb, it will be about 15 minutes to the top on a good day. Although there are steeper climbs to come I always find this one the hardest and I try to block out the pain and focus on staying relaxed. A walker is coming down the path from the summit and I set myself the challenge of getting to the stile before they do. A cheery “howdo” from the walker as I start the rocky steps and change my stride, taking shorter, faster steps as I hit each slab. I think of the hard work that went into constructing the path and wonder how many times I have run up it, how many heartbeats I have spent on it, how many breaths? The summit gives a welcome rest and even though I’ve been here many times I never tire of the scenery, taking time to soak up the views: the ridge continuing west to Back Tor, Mam Tor and on along the Edale skyline towards the remote Brown Knoll; then the Edale valley with the village itself tucked away below Grindslow Knoll; and to the north west across the valley the flank of Kinder and its deep incisions of Ollerbrook, Lady Booth and Jaggers’ Clough. I have choices to make now, I could retrace my steps down the flagstones then off down through the fields towards Hope and back up via Twitchill Farm and the steep, steep fields leading back to Win Hill. But today I seek a longer run and my eyes turn to the north as I look over to the route I am going to take, down to cross the Edale valley and back up to the edge of Kinder. So I press on along the well worn path, up and steeply down Back Tor taking care not to trip on the tricky descent and then, glimpsing Castleton below on my left, onwards to Hollins Cross. Down now on the rough path and tiptoe through the slurry and inquisitive cows at Peter Barn before crossing the road and taking the path to Ollerbrook. I’m off the tourist trail now and the steep bilberry clad slopes and rocky outcrops beckon me to my favourite part of the route, the steep climb to the gritstone prominence above Rowland Cote moor. Heather and bilberry ally with the steepness of the slope to slow me to a walk as I take the line of least resistance up to cross the fence then up the final steep few metres, hands on rock and heather to emerge on the plateau. Here again a rest, sitting down facing south, a handful of jelly sweets the physical reward, the view and the solitude offering a deeper, intangible satisfaction that will stay with me not burn away with the coming miles. I am now eastbound, skirting the head of Jaggers Clough and losing height as the rough path gives way to grassy fields down Crookstone Hill and meets the bridleway passing Hope Cross. 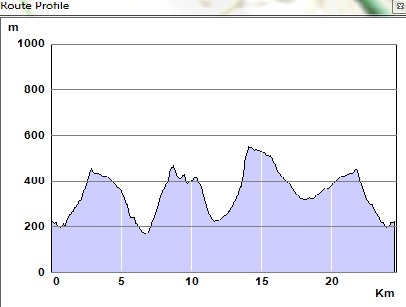 The early part of the Edale Skyline fell race takes this route, the runners still fresh before the toil to come. For me tiredness is beginning to creep into the legs but the ground allows me to maintain a steady pace and I can see in the distance the summit of Win Hill, my next target. For some reason this stretch can seem to take ages so I play mind games, not allowing myself to look towards my goal until the next wall, that way it looks much closer when I finally allow myself a glance. Along the last flat stretch and up the final path, keeping running until I touch the trig point and the last climb is done. I take in the view again, this time looking back over the route I’ve taken. Satisfied, I set off on the descent back to Ladybower taking care with tired legs on the rocky steps. Into the woods again, reversing my outward route to emerge at the reservoir and glance at the scary “plughole”, overflowing after recent rain, as I pass it by. (I always wonder what’s down there). Across the dam wall again and the final 400m to the car, happily tired – I won, I lost, no I won!